Social media: is it selling or sharing? These days, it’s a bit of both. As a writer, or anyone with a product to promote, social media presents powerful platforms. You can spend more time socializing than writing, so where do you focus your attention? Pinterest is a social media cut-n-paste website to collect and save online items meaningful to you. Neater than a folder of newspaper clippings from back in the dinosaur days, when you find an image or idea that you want to remember, you “Pin” that image to a “Board” that you create. Presto! Your collection begins. The anatomy of a Pin is an image, the description and the website link. The image is the specific, intriguing picture from the website. If the site isn’t set up to instantly open Pinterest when you hover over the image, you can manually add the image to your Board with the Pin It button you download from Pinterest and save to your computer’s internet taskbar. The description is whatever you type in as a reminder to you–a cool title, the inspiration for saving it, your impressions–all in 500 words or less. The website’s link automatically attaches as an electronic sticky note to the “Pinned from” line, and this takes you back to the original post. If you Pin directly from your smartphone, the Pinned from line simply states, “uploaded by user,” thus creating a static image gallery. Boards group specific topics or themes together, such as: recipes; parenting; DIY crafts; men’s fashions; travel destinations; and home décor. Quotes and infographics are popular, too. If you want to connect with users—or Pinners—who share your interest, search the site by category, keyword or user names. Here’s where the social aspect steps in. When you discover an image someone else saved, you can Pin that Pinner’s pin to a Board you created, and vice versa. To see a Pinner’s latest discoveries, you “Follow” that person, and then you choose to follow all or just some of their Boards. The most popular Pins, popular by Likes or Pins, come up highest on any search. It’s important to be social to be discovered. Remember that, “Pinned from”, direct link I mentioned above? This is where the promotion aspect steps in. You want to send people to where the action is, so create Boards that link directly to your blogsite, etsy shop or Amazon page. Create exciting titles and use the description box wisely. Like other social media, use #hashtags to group your pins and to be instantly site-searchable. Type in an additional website link in the description box, and it is an active link, giving you additional promotion tool option. Who do I like? Who uses Pinterest well? Who inspires me? Drive traffic back to your own website like blogger Laurel Regan (Alphabet Salad) by grouping her blog posts, most recently for her April 2015 A to Z Blog Challenge posts. I found her through that blog hop, and she inspired me to create my own A to Z blog posts Board. Intrigue your current and future readers like writer Wendi Knape (Wendijowrites) does by teasing them with images that inspire her writing. One of her stories, Jacob and Charlotte – Meet Cute, features the characters Jacob and Charlotte. Wendi created a Pinterest Board to describe her characters’ “development, clothes, hair, living space [and] favorite foods.” This inspired me to give readers insights into my own writing process through my “Author Inspiration” board. My use of Pinterest has been a mixture of art and writing. “Scrapbooking and artsy-fartsy stuff” collects mini-album and ephemera ideas to pitch to my editor of Michigan Scrapbooker Magazine for future articles. My Zentangle boards promote my classes as a Certified Zentangle Teacher (CZT) and artwork that inspires me. Why not let others know what moves me, as well as inspires my works of art? “Holiday Festivities” gathers spooky ideas and recipes I use to create great visual images for my blog’s annual Halloween post. See how I used the ideas to create party atmosphere in my 2014 Halloween Party blogpost. 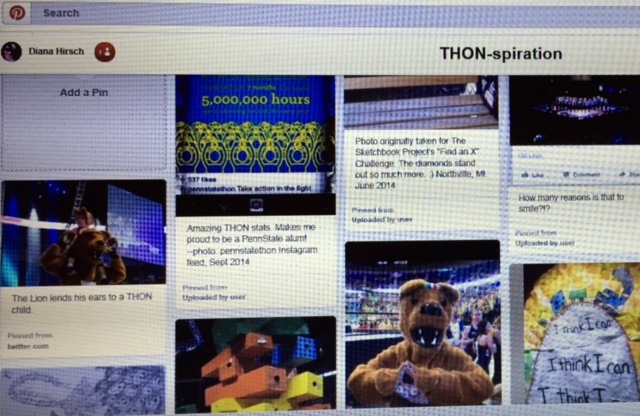 “THON-spiration” collects images related to the fight against childhood cancer and The Penn State Dance Marathon (THON); it is currently my most popular board. As I was typing this post, I created “Books by D.W. Hirsch” Board. In the first 24 hours, I had 24 followers. How cool is that! I can’t guarantee any success like that, but I can share tips I’ve discovered along this social journey. Creative titles. Make your Boards sound so exciting that people can’t resist clicking on them. Maximize the description box. Don’t write wordy paragraphs; space out long sections of sentences. Include hashtags, keywords, and related websites, but use tabs or double-spaces between these words. Choose the most interesting, active image to Pin if you have multiple options from a website. Credit the original artist every time you share personal content. Let them know you’ve done that and they may follow you back. Writers you like and blogs you follow. Be sure to describe why you include them. Books you like or want to read. This gives people a look into your personal likes, and they may discover a new book to read after seeing your interests. Share and be social: promote other bloggers or writers by posting their content. List blog or writing challenges for future exploration. Promote personal blog posts. Group these sites into related categories and boards. Share other media images like screenshots of your Twitter posts. Be mindful of others’ privacy. Pinterest works best for people who actively wander around the Internet. Creating a Board or Pinning an item can take as little as 3 minutes, but this may be an awkward medium for some. It takes time to ensure the correct link, to write an appropriate description, and then roam around Pinterest looking for people to connect and share interests. What site platform works best for you? Are you still discovering? Share your thoughts in the comments below. Thanks for explaining Pinterest. I’ve heard of it & tried it but never really understood it. Interesting article. Thanks for the insight into Pinterest. Now if I can just find the time to give it a try!